Gino Bartali is best known as an Italian cycling legend who not only won the Tour de France twice but also holds the record for the longest time span between victories. In Road to Valor, Aili and Andres McConnon chronicle Bartali’s journey, from an impoverished childhood in rural Tuscany to his first triumph at the 1938 Tour de France. As World War II ravaged Europe, Bartali undertook dangerous activities to help those being targeted in Italy, including sheltering a family of Jews and smuggling counterfeit identity documents in the frame of his bicycle. After the grueling wartime years, the chain-smoking, Chianti-loving, 34-year-old underdog came back to win the 1948 Tour de France, an exhilarating performance that helped unite his fractured homeland. 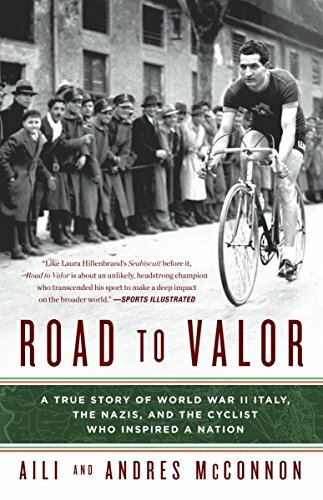 Based on nearly ten years of research, Road to Valor is the first book ever written about Bartali in English and the only book written in any language to explore the full scope of Bartali’s wartime work. An epic tale of courage, resilience, and redemption, it is the untold story of one of the greatest athletes of the twentieth century.